From Jim Metrock: The article below is from November 15, 2005. Since that time I have been to Italy and I still like Rome, Georgia better. I recently contacted the Rome City school district and found out that Channel One News is gone from its schools. I don’t know when it was given the boot – it could have been after my article in 2005 embarrassed them or it could have been this year. Anyway the good news is students in Rome, Georgia have more school time than those students in 2005 and before. When I was in the wire business back in the 80’s, I had a lot of great customers in Rome. It’s a beautiful little town in a scenic part of northwest Georgia. So it was sad to come to Rome this morning as see a local high school do a really dumb thing. Students mess up and get in trouble occasionally, but today it was the principal, Tygar Evans, who goofed up big time. Around 1 P.M. today, students filed into their gym to experience a concert by Sony/BMG recording artists Switchfoot, sponsored by Verizon Wireless and orchestrated by Channel One. As we have reported before, Channel One News is losing advertisers. Therefore C1N must look for other ways to garner ad revenue. One way is to provide advertisers with unique marketing situations and offer opportunities to cross-promote one advertiser with another in a way that makes sense to both. Several weeks ago, Channel One made a deal with Sony/BMG Music and Verizon Wireless that would give both a remarkable opportunity to promote their company’s wares and – and, this is the “good” part, it would be significantly underwritten by taxpayers. 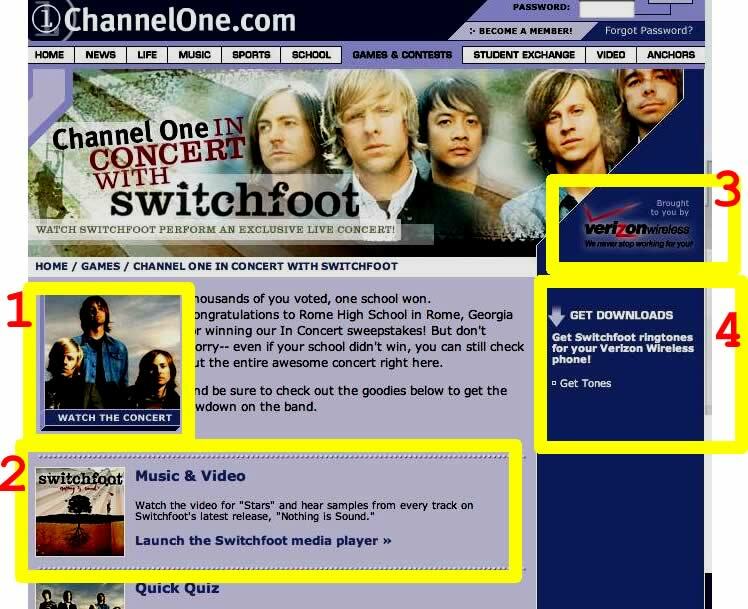 Channel One would use its “news” show to advertise a contest where the winner’s school would be the site for a concert by Switchfoot. Verizon would sponsor the concert and get to promote its brand of wireless service to students. The deal was almost too good to be true for Sony and Verizon and indeed there was a major hurdle. What public school would host such a commercial stunt? Channel One had to find a school district that would allow a rock concert DURING school time. That was going to be difficult. Heck, New York, Channel One’s home state has never allowed their TV show to be shown to any public school student, much less, have this company stage a rock concert in an NY school. Sony, Verizon and Channel One lucked up – they found Rome High School and principal Tygar Evans. Mr. Evans saw no ethical problem with letting Sony/BMG use Georgia taxpayer money to help promote one of its bands. He saw no problem with Channel One disrupting a big part of a school day. Mr. Evans was so excited about the concert that he gushed to a reporter that the band was bringing a lighting person from France, FRANCE!, to his school. Wow. In an article in the Rome News-Tribune, Mr. Evans said he was going to bring in more security for the concert to stop students from other schools from crashing the 1 PM Switchfoot concert. Earth to Principal Evans: You don’t need the extra security. The students you are worried about are IN CLASS at neighboring schools. They are going over math problems, learning about American history, and reading Shakespeare. You assume other principals are like you. Wrong assumption. When I was in the school, I saw that signs had been painted and their was a festive atmosphere at 10 AM hours before the concert. It is reported that the band played 6 songs. The concert may have ended around 1:45 or 2. Were students going to go back to their academic classes after the concert? and if they were, was the atmosphere conducive for serious learning? a Rome High School student’s personal website. The lead singer reaches out to the shouting crowd of Rome High students. Channel One wanted the cheerleaders in uniform and of course the principal made it happen. Sony/BMG and Verizon get more promotional opportunities when the TV show directs young people to go to channelone.com. There several sections help to further promote the band. There is nothing subtle about this marketing effort. 1. 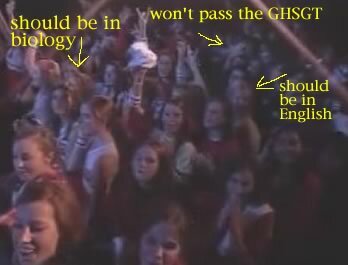 A video of the in-school concert can be seen by those who missed it. This type of exposure is incredible for a band trying to pump up sales of a new CD. 2. The new CD is “Nothing is Sound” (sounds like a song about the principal’s lack of sound judgment). Nothing like a music video to help drive sales. (Channel One News considers this “news.” The Switchfoot concert was their TOP story of the day on their website. 3. Many schools restrict cell phone use, but for years Channel One has been heavily advertising cell phones and wireless services. Verizon was the sponsor of Rome High’s rock party. 4. Perfect cross-promotion. Sell kids Verizon Switchfoot ringtones for a couple bucks a pop. RICH: AND THAT’S GOING TO DO IT FOR US, BUT BEFORE WE GO WE WANTED YOU TO KNOW OUR SHOW IS GOING TO BE ON THE ROAD TOMORROW. MELISSA: THAT’S RIGHT, CALI AND ERROL WILL BE IN ROME, GEORGIA FOR THE CHANNEL ONE IN CONCERT WITH THE BAND SWITCHFOOT. SHOULD BE A LOT OF FUN. RICH: YES, THEY HAVE SOME GOOD SONGS. MELISSA: THEY SURE DO. TAKE CARE, GUYS. BYE-BYE. ERROL: ALRIGHT — VERY NICE! WHAT’S GOING ON, EVERYONE?! I’M ERROL BARNETT — THIS IS CALI CARLIN, AND WE ARE HERE AT ROME HIGH SCHOOL IN THE BEAUTIFUL TOWN OF ROME, GEORGIA. CALI: AND WE HAVE AN EXTRA-SPECIAL SHOW FOR YOU, BECAUSE HERE WITH US TODAY IS THE BAND SWITCHFOOT. AND THAT’S BECAUSE THE LUCKY STUDENTS HERE WON OUR “CHANNEL ONE IN CONCERT” CONTEST… SO, IN JUST A FEW MINUTES THEY’RE GOING TO JOIN THE REST OF THEIR CLASSMATES FOR THEIR OWN PRIVATE PERFORMANCE FROM SWITCHFOOT. ERROL: BUT FIRST WE HAVE TO GET INSIDE AND GET THINGS STARTED… SO CALI, LET’S GO! CALI: SEE YOU INSIDE. ERROL: ALRIGHT, VERY NICE. HEY, ROME HIGH SCHOOL… YOU GUYS READY TO KICK OFF THIS SHOW? ALRIGHT, WELL I GUESS WE BETTER BEGIN THEN. I’M ERROL. CALI: AND I’M CALI… AND YOU GUYS WILL HAVE PLENTY OF TIME TO SCREAM AND YELL LATER BECAUSE HERE WITH US TODAY, STRAIGHT FROM SAN DIEGO, IS SWITCHFOOT. GIVE IT UP, YOU GUYS. ERROL: SOUNDS LIKE THE STUDENTS REALLY LIKE YOU GUYS — LET’S GET SOME INTRODUCTIONS. SWITCHFOOT: MY NAME IS JON … WHAT’S UP? I’M JEROME … AND WE ARE SWITCHFOOT. CALI: THANKS, GUYS, YOU’LL BE HELPING US OUT THROUGHOUT THE SHOW, BUT FIRST LET’S THROW IT TO ERROL FOR A LOOK AT OUR TOP STORIES. ERROL: ALRIGHT, MOVING QUICKLY NOW, HERE’S A LOOK AT WHAT’S MAKING NEWS TODAY. ERROL: THAT’S RIGHT … COMING UP NEXT — SWITCHFOOT IN CONCERT! CALI: WELCOME BACK. ALRIGHT, ROME HIGH SCHOOL, IT’S ALMOST THE MOMENT YOU’VE BEEN WAITING FOR. YOU READY? … JUST A COUPLE MORE MINUTES. CALI: WELL, THAT DOES IT FOR ERROL AND I, BUT THANK ALL OF YOU FOR BEING WITH US. ENJOY THE SHOW. ERROL: SO NOW, AS THEY TAKE A BREAK FROM THEIR “NOTHING IS SOUND” TOUR, GIVE IT UP FOR … SWITCHFOOT! *** This song is called “Stars” the first single from Nothing Is Sound. It is currently climbing a variety of charts including Adult Top 40 (#26), Rock Airplay (#39), and Modern Rock Tracks (#16). “Stars” is currently #4 on Blender’s “Most Popular Songs In America” chart. A recent tour and heavy promotion, such as the Rome High School publicity event, has made Switchfoot a very lucrative band for Sony/BMG. Rome City Schools board of education thought renting TV equipment from Channel One News was a good deal. The Board didn’t think buying their own TV sets was worth it. They made a horrible financial decision. As bad as November 15th was for students and taxpayers, at least the concert just took up time for one day. The real tragedy at Rome High is that 12 to 13 minutes a day are spent “paying the rent” by watching Channel One’s TV show. The contract demands that the school show students the show at least 90% of all school days. They are only given 18 days a year that they may not show the TV show and its controversial commercials. That equates to roughly one hour a week. That adds up to the loss of one instructional week of school each year spent passively watching TV. The students pay the rent with the loss of time. Mr. Evans and the school board and the superintendent don’t pay anything. Teachers get a paid break when Channel One comes on. That’s why some teachers don’t like to give up their electronic babysitter. 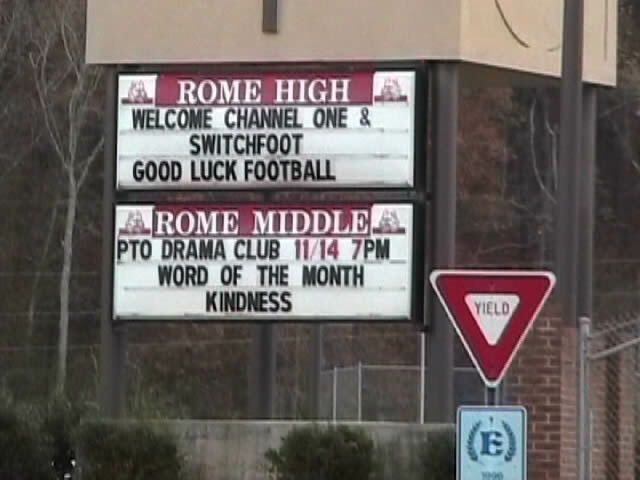 It will be the citizens of Rome, Georgia that throw Channel One out of the Rome City school system. Obviously, it won’t be the principal. Right now Channel One owns an hour a week of Rome school time. Citizens need only call their school board to stop this misuse of school time.